Hi, friends! Like the watercolor look? Like cards with glitter on them? 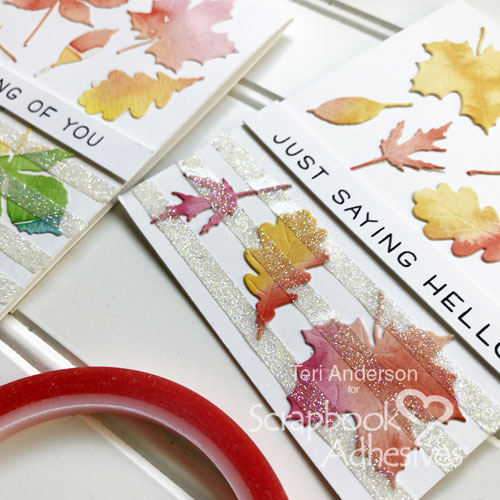 You are going to love learning how to make some paper crafted cards like these! Read on for the quick and easy tutorial! The first thing you are going to do is make the background. Create a standard A2 card from white cardstock. Set it aside. Take a piece of watercolor paper and brush on several different colors of watercolor paint onto it. Let the paper panel dry. Then take some leaf dies and cut several leafy die-cuts with them from the panel. Not a fan of leaf dies? Consider using different shapes like hearts, flowers, and stars – all would look lovely on a card too! 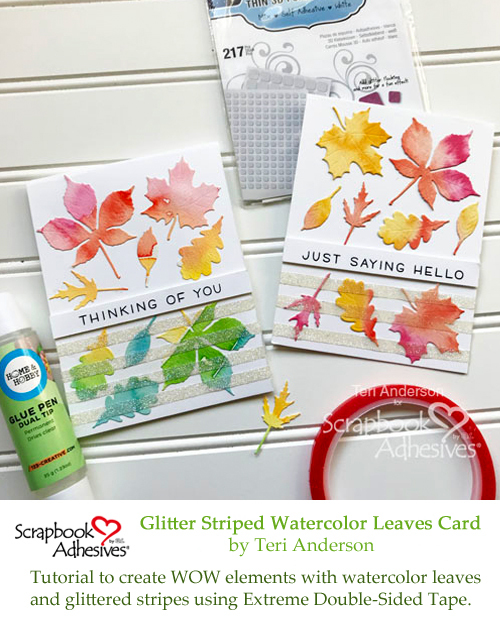 Adhere the leaves onto your card with the Dual Tip Glue Pen. 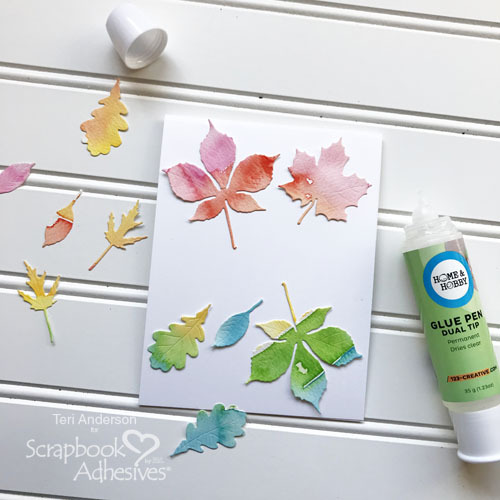 Be sure to cover the back of the leaves thoroughly with glue so nothing pops up and off the card. Cut a strip of cardstock and stamp a sentiment onto it. 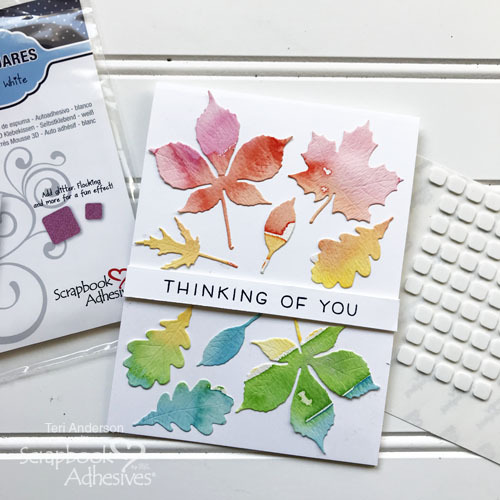 Use Thin 3D Foam Squares White Mix to adhere it the card. I like these thin squares because they make card elements pop but they don’t make them too bulky. 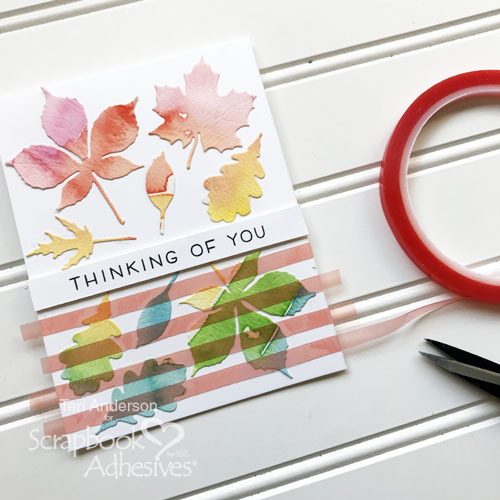 Place several strips of Extreme Double-Sided Tape 1/4in across the bottom of the card. Let the tape run off the edges of the card. Use your scissors to snip away the excess. 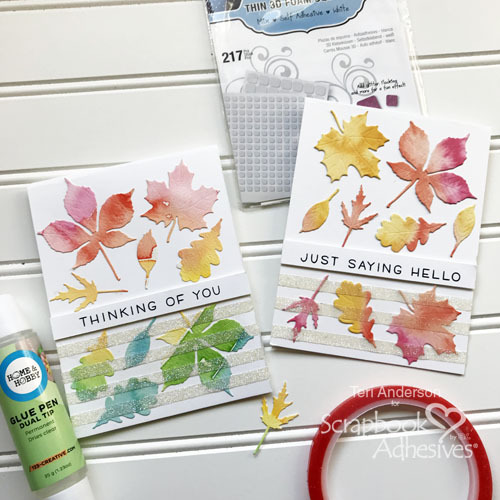 Take an embossing powder bag and rub it over the tape strips and the areas near the tape strips. (Don’t have a powder bag? Try using a dryer sheet instead.) 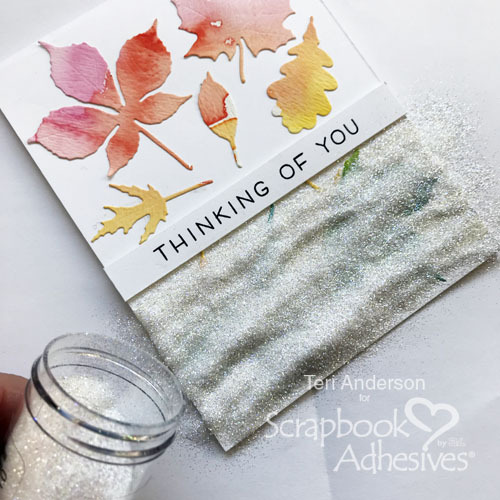 The purpose of this rubbing is to remove static so extra glitter will not stick to the project. Remove the red liner from the tape. 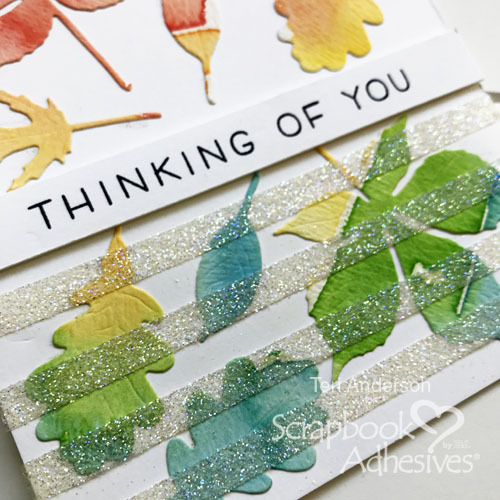 Set the card on scratch paper and dump glitter onto the strips. Shake the excess glitter off your card, and you’ll be left with some awesome glitter stripes. Remember, it’s up to you how many stripes you add to your card. You can add three, four or more! The possibilities are endless! This entry was posted in 3D Foam Squares, Adhesives, Beginner, Cards, Crafts & Tutorials, Extreme Double-Sided Tapes, Fall, HomeHobby by 3L, Other Adhesives, Seasonal Craft Ideas, Skill Level, Tutorial, Wear your Adhesive on the Outside and tagged Card, Card Making, Dual Tip Glue Pen, Extreme Double-Sided Tape 1/4", Glitter, HomeHobby by 3L, Impression Obsession, Lawn Fawn, Prima Marketing, Teri Anderson, Thin 3D Foam Squares White, Tutorial, Watercolors. Bookmark the permalink.